You might be wondering why I'm interested in NFL pick 'em pools in the middle of March Madness. Well, there are already plenty of statistical analyses on the NCAA basketball tournament. Here are a couple of sites to get your bracket filled out scientifically. But for now, I've got the luxury of time before the NFL season starts, or even draft season, when I can think through these things. In the last post I looked at using the point spreads as a baseline for picking winners. I looked at the accuracy with which the point spread correctly favored straight-up winners. Over the past six seasons, the spread was accurate about 67% of the time, and no single week showed any statistically significant deviation from the overall average. In other words, the spread is no more or less accurate in early or late weeks than throughout the season. The reason I analyzed spread accuracy by week was because when you're behind in a pick 'em pool, you'll probably have to gamble on some upsets in order to catch up. I wanted to know if it was to your benefit to go against spread favorites in any particular week. The answer is no. But what about spread amounts? It certainly makes sense that games with +1 or -1 spreads will be less predictable than games with +14 or -14 spreads. But how much less predictable? Is there a point of inflexion when it never makes sense to go against the spread? Are there situations when it's basically a toss up and the spread is no more accurate the flip of a coin? Below are the answers. The graph shows the accuracy of the spread in terms of predicting the straight-up winner for each spread amount. Data is from all regular season games from 2002-2007. 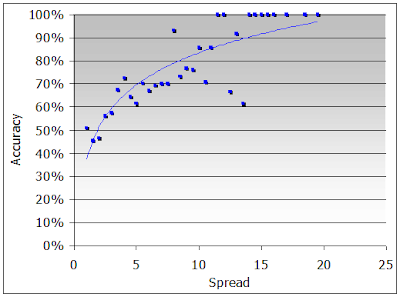 As expected, the spread predicts winners more accurately with increasing spread amounts. Note the fan-shaped dispersion of the data points. Some spread amounts are far less common than others. For example an 8-point spread is less common than a 7-point spread. At the least common spread amounts, there are fewer cases and therefore a wider range of accuracies. Also notice how games with spreads less than 3 points are no better than 50% accurate. I wouldn't expect much better than 50% - 55%, but less than 50% is surprising. The 'home underdog' phenomenon has been established in previous research. This may be due to many observers underestimating the home field advantage due to weather conditions late in the season. But whatever the reason, the home underdog effect clearly exists. 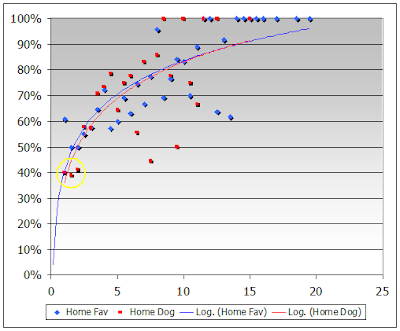 The graph below breaks up the spreads into home underdogs and home favorites. Notice the 40% accuracy of low-spread home underdog games. When the spread is below +2.5 points, the home underdog is not only likely to cover, but will probably win. It makes sense to pick upsets in low-spread home underdog games. However, there have only been 70 such cases in the past 6 years, averaging about 11 games per year. If you go for the underdog in all 11, on average that gives you a 2-game edge over someone picking all favorites. It's not nearly enough of an advantage to guarantee you bragging rights around the office, but every little bit helps. And if you need to catch up in the later weeks, games with low spreads and home favorites aren't much better than 50%. Going with upsets in such games would make sense because it's not a bad gamble and your leading opponent might be playing it safe by picking all favorites. You'll want to be very careful picking against the favorite in games with spreads more than 3.5 points, for either home underdog or home favorite games. The odds against you climb rapidly beyond that point. Can you sort out the AFC vs. NFC matchups by point spread? It is my impression from looking at results that there is more uncertainty (the favorite loses more frequently) in these kind of matchups. Sure, just give me a little time. I'd have to code each game. While I'm at it, I might as well look at inter- vs. intra-division match-ups too. I'd bet you're right. There is simply less data to "slot" teams between conferences. For example, we might have known that DAL and GB were 1 and 2 from the NFC most of the year, but where would they slot in the AFC? Inter-conference and intra-conference games are nearly equally predictable. Intra-conference game outcomes are predicted correctly by Vegas spreads 66.6% of the time, and inter-conference games are predicted correctly 65.7% of the time--not enough to be noticeable. The perception may have come from 2002 and 2003 when intra-conference games were predicted correctly significantly more often. But last year was the opposite. Inter-conf games were predicted correctly 67% of the time, and intra-conf games were predicted correctly 76% of the time. Any one year can be misleading, but the past 6 six years together show very even predictability. The difference in the individual year rates is partly due to how predictable the individual match-ups were that year. For example, in 2002 the inter-conf games averaged a 4.8-point spread, and the intra-conf games averaged a 5.4-point spread. hmmm, interesting. Using the "simple rating system" (points scored, points against, adjusted by opponent), I've looked at matchups from 2002-2006. I haven't added in the 2007 numbers yet. So, this is a retrospective look (knowing how good a team turned out) rather than an at the time perception like point spread. But the better team by SRS won fewer times in intra-conference games, than conference games, and both were fewer than division matchups. This was particularly true when the better team was better by 10 points or less and playing on the road. Intra-conference road dogs were fairly dominant. I don't have the numbers in front of me, but IIRC it was the "better team" (excluding those within +/- 2 pts by rating) won about 75% of the time in division games, 72% in conference, and 67% in intraconference. The home winning percentage in intraconference was also much higher than divisional games. Now, it could be that the ratings are wrong, or not as exact because there are fewer connections. I also wonder if Vegas knows some of this, because you're looking at spreads. They might be setting the lines slightly differently to offset some differences. On an unrelated note, I had success in a pool picking road teams in the similar climate division matchups (excluding Denver). These would be the NYJ-BUF-NE games, all AFC North games, HOU-JAC-TEN in the south, SD vs OAK, OAK vs KC, PHI-WAS-NYG, WAS-DAL, GB-CHI, and SEA-SF. The home team in these matchups has covered only 42.9% of the time since 2002. When the lines were relatively close, or sometimes even not, I successfully picked several underdogs on the road this year in these matchups where I was getting value relative to the picks of the rest of the pool. Which brings up another point. If your pool awards weekly winners, it is better to be intelligently risky, and less conservative, in taking underdogs. I won 43% of the games where fewer than 25% of the pool participants (18 participants). That’s pretty good for perceived longshots, but still not over 50%. But on a week to week basis, I did good when those calculated gambles hit, winning 4 out of the 17 weeks, but finishing 3rd overall. One final observation. It appears the home favorites of 10 points or more lose a lot more frequently than road favorites of 10 or more. I suspect, if this is true, it is because the marginal advantage of HFA when teams are mismatched is far less than when they are roughly equal. Thus, if the betting public is assigning a 3 point HFA across the board (and Vegas is responding to the public even if inefficient), then the heavy home favorites will be overvalued and heavy road faves will be undervalued. Great article for sure. Can you help share some data with me, or tell me find where I can access raw data like this. It would be great to see the numbers behind your charts, like a table with the exact point spreads and game results, because it's a little tough to discern visually on the graphs. I'm also trying to get an idea of which points on the graph have fewer data points behind them (like you mentioned as infrequent point spreads), versus which data points can "be trusted" more confidently. Another excellent column Brian. Any numbers that you can run with regards to the prime-time games (i.e. Sunday and Monday nights) My rationale is the players tend to be more jacked-up when they are on prime time and the coaches will probably play a little bit more conservative in the limelight. Great stuff as usual, Brian. With every game, the oddsmakers also publish a 'moneyline' to go along with the spread. One can easily convert the money lines into odds (adjusting for the vigorish), to get expected winning percentages by point spread. I have also had the theory (never tested it) that in order to get a better measurement of win likelihood by point spread, one must also look at the over/under. A 3.5 point spread where the over/under is 35 should be a lot more 'meaningful' than a 3.5 point spread where the over/under is 56, shouldn't it?